When I work the super-early shift on the radio – please don't even ask me what time I have to get up – I get ravenously hungry by the time my break rolls around just before 9 a.m.
At that point, I've usually eaten breakfast and at least one snack, but all that food always feels like it's part of the very distant past. I need my black tea and more snacks now. A few weeks ago, I walked over to Credo, which makes some of the best Assam tea in Edmonton. I love how they actually brew the tea for me, so I don't have to fiddle around with extracting a sopping wet tea bag from my too-full cup. Credo had the usual muffins out, but then I spotted a big silver pan of warm granola bars. I tilted my head and considered it. Honestly, I had never understood the appeal of homemade granola bars when I already make my own granola. The girl behind the counter cut me a bar that was almost as big as my hand and put it in a little white paper bag. I looked at it dubiously and thought I could probably save it for snacks for the next two days. I sat down in a big armchair while my tea was steeping and cautiously took a bite. 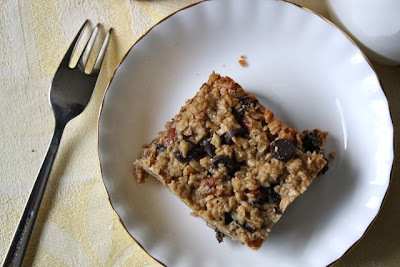 It was warm and oat-y and there was just a bit of chocolate and it was exactly the right chewy thing. I had eaten the whole bar before I left the café ten minutes later. Then I remembered reading about chewy granola bars on Orangette more than a year ago. I dug up the recipe and tried it out. They turned out a bit different from Credo's – for one thing, I try not to cut as big pieces – but they're really, really, really wonderful. 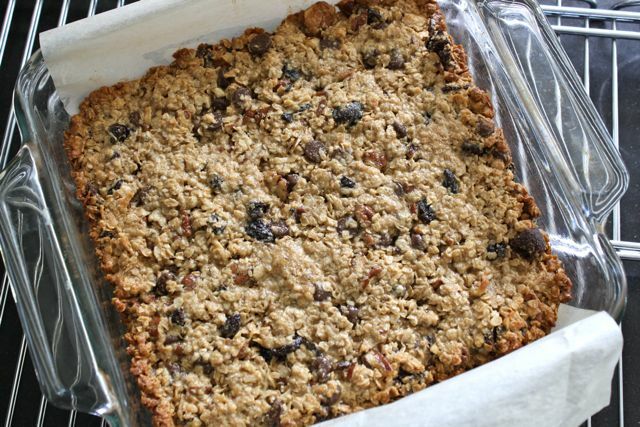 You drizzle this mixture of peanut butter and honey and vanilla and melted butter over a tumble of oats and chocolate chips and whatever dried fruit and nuts you have around, stick it in the oven, and you're in business. I guess I go through snack phases (hummus and crackers, yogurt and honey, etc. ), and this is my current snack phase. When I need a snack, these are all I can think about. Luckily, I have at least two snack times scheduled each day. P.S. I like the way Molly keeps these oat-centric, with just hints of nuts and dried fruit. She was also brilliant enough to add chocolate. But it appears that the original King Arthur Flour recipe lets you use lots more nuts and fruit, if that's your thing. Preheat the oven to 350 degrees Fahrenheit. Butter an 8 by 8 inch baking pan. Cut a piece of parchment paper into a rectangle that will line the bottom of the pan and overhang on two ends. 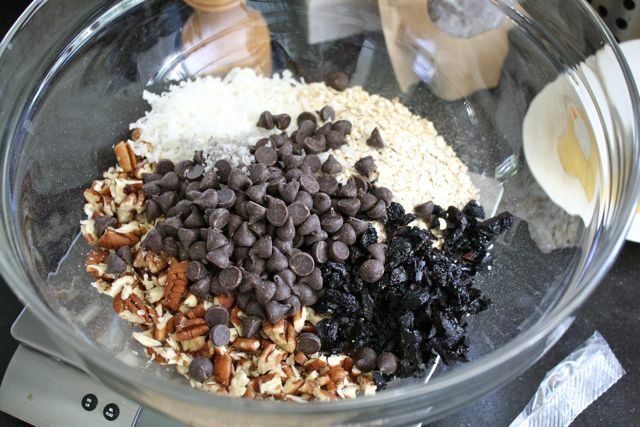 Take out a big bowl and mix up the oats, oat flour, brown sugar, pecans, chocolate chips, coconut, flax, dried fruit and salt. 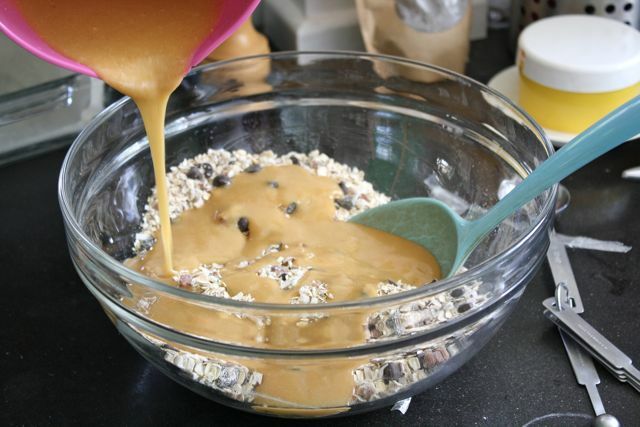 In another bowl, whisk the nut butter, vanilla, butter, honey and water together. Drizzle over the oats and friends, and mix well. Dump the mixture into your prepared pan. Use a piece of plastic wrap to press it down evenly. Bake for about 30 minutes. Start checking on them after about 25 minutes. The edges will get golden and (hopefully) the top will also get a bit golden (although not as much as the edges). Put the pan on a rack and let cool completely. Then put it in the fridge for a few hours. 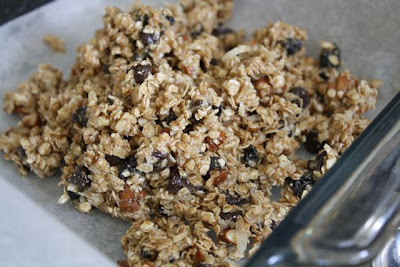 Do not attempt to cut them into squares before they are thoroughly chilled or you will freak out because they'll all fall apart and you'll think you've made granola cereal instead of granola bars. Of course, if you need to cut a bit out while it's cooling to taste, that is absolutely recommended. 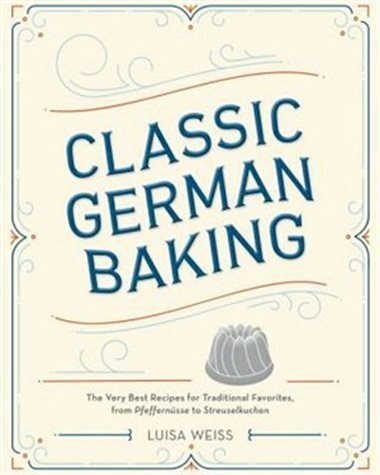 Just don't stress about its crumbly nature when it's warm. I keep mine in the fridge because it's almost summer, but I hear they're fine wrapped on the counter, too. They've certainly held together for hours in my lunch bag outside of the fridge. * I've also used regular rolled oats and they were good, but a bit more crumbly. If you are gluten-free, make sure you get oats that are labelled "pure" and "wheat free." This means they have not grown next to wheat or been processed in a factory that also processes wheat. 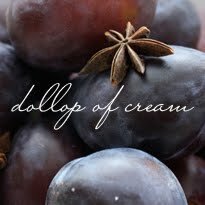 This morning radio gal is mixing up a batch as I type! I was just trying to brainstorm snacky food to make for tomorrow, and decided to see what you had going on... yum! I am totally making these - thanks for the tip!! I am definitely going to make this tomorrow!! They look really easy to make and really delicious. Thanks!! Hi! I'm a bit confused about the parchment paper and buttering of the pan. Is it to make the parchment stick properly? Good question! I honestly don't know, but didn't want to change it and mess with a good thing. I think it would be to keep the parchment paper down, as you suggest. But it does seem like a lot of extra work, doesn't it? If you try it without buttering first, will you let me know how it works out? Hey! Just made a batch - can't wait to try them! Hope you guys are well - been thinking about you lots! We miss you, too, Wendy -- I keep thinking about our great visit this time last year . . . I'm still making your mango slaw all the time! It was a fantastic visit last year! And good news - my cousin is moving to Edmonton, so now I have another reason to jet out! !